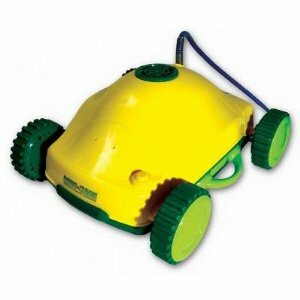 This automatic above-ground pool cleaning robot worked well for one season. For the $250 we paid for it, the cleaner did a fine job, aside from occasionally getting stuck on the small ridges of our not-so-flat pool bottom surface. However, the machine is not intended to ever be repaired. After my kid pushed it around and stripped the drive motor, I attempted to buy a new one. Even though I disassembled the unit and pulled out the motor, when I called the manufacturer, I was only given a short list of replacement parts I could buy (filter bag, power supply, etc.) The motor is completely unavailable for purchase even though it is one of the handful of parts that is likely to fail first. The machines are apparently slammed together in China and sold here, unsupported, buy its "manufacturer". Caveat emptor. My robot just died, I took it apart, and it looks like water get in to the motor. Well If anybody needs some parts let me know, I will not be fixing it. All other parts are great! Any suggestions? Hello MN how much are you selling the green power box for? I have a RoboClean and love it! However recently it has stopped pulling itself and sucking up the debri. What do I need to do? Will a small engine repair shop help! Or do I need to buy another one? I am looking for the green power box that you plug the cord into. Mine broke where you plug the vac into. The wires are showing and I don't know who could fix it. I think it got too hot. I have looked on ebay and other sites and cannot find one anywhere. I love this vac and it has done a great job for years and I really can't afford another one. Please Help! Aqua Quality Pools & Spas, Inc in Westbury NY should have the parts you need. Anyone know where to get a power cord(umbilical) for this unit? I have a robo kleen with a broken axle. Checked E-bay, but came up empty. Any other suggestions would helpful. motor stopped. expensive piece of crap. Was a good machine when it worked. Have only had it a couple seasons, now the motor I assume is shot, it moves about but will not pick up anything. Understand you cannot get a replacement motor. Shame on Robo Kleen. Certainly not worth the money. I asked a Dolphin repair shop about motor availability. He said the motor would exceed the cost of a new machine.